See 2012 World Matchplay runner-up James Wade in action at The Untouchables,Eastbourne on Friday 19 October. But Wade grabbed a crucial break of throw before getting the job done on double six, to move into Sunday evening’s £100,000 final, where he meets Phil Taylor. Michael van Gerwen wowed the Winter Gardens with a wonderful nine-dart finish in an explosive performance, as he saw off Steve Beaton in Blackpool. The 23-year-old Dutchman hit six ton plus finishes in a 13-9 triumph to set up a quarter final clash with James Wade, who was impressive in a convincing 13-4 success over Mark Walsh. “It was a special moment for me,” said van Gerwen, on hitting his second televised nine-darter. “I have been playing really well on the floor which has given me a lot of confidence and tonight it all came together on TV. Wade, who won nine consecutive legs in his triumph over Walsh, said: “I did alright tonight and I’m glad to get through. There was disappointment for Raymond van Barneveld however, the Dutchman failed to reach the quarter-finals in Blackpool for the first time ever after suffering defeat at the hands of Terry Jenkins. Michael van Gerwen hit a sensational nine-dart finish in an incredible performance, which saw him defeat Steve Beaton 13-9 in round two of the Betfair World Matchplay. The Dutchman powered past his opponent to reach the last eight for the first time at Blackpool’s Winter Gardens, hitting six finishes of over 100 in an explosive triumph over the former World Champion. “I was delighted with my performance,” said van Gerwen. “Especially as I kicked on well after the nine-darter. “That was a very special moment for me and I enjoyed playing in such a brilliant match because Steve played very well too. The first six legs of the match went with the throw, with van Gerwen taking out finishes of 108 and 116. But it was Beaton who grabbed the game’s first break of throw, taking out 90 before van Gerwen responded with a brilliant 128 out. Then came the magical moment, with ‘Mighty Mike’ hitting back to back 180s before sealing his spectacular nine dart finish with a 141 checkout. The 23-year-old followed that up with another briliant checkout, this time 116. Beaton levelled before the former World Master reeled off four legs in a row to take a 10-6 lead. ‘The Adonis’ took the next two before van Gerwen produced another fantatsic finish, taking out 120 in a leg that included his sixth maximum. Beaton pulled it back to 11-9 before van Gerwen closed the match out, adding another 180 to end with an average of 104.36 – the highest of the tournament so far. JAMES HUBBARD will celebrate his 20th birthday by making his Betfair World Matchplay debut on Tuesday night – but opponent Wes Newton is determined that a celebratory cake is the only present he receives from their clash in Blackpool. World Youth Champion Hubbard will continue his remarkable rise when he steps onto the Winter Gardens stage – having competed in an amateur tournament in Blackpool last summer. 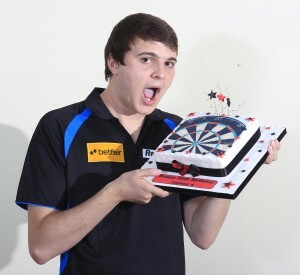 Having turned professional in November, the 19-year-old has soared to stardom and recently qualified to play in the £400,000 World Matchplay. “It’s a dream for me to be playing in this event,” said Hubbard. “Winning the World Youth Championship was special but I wasn’t a professional when I qualified for the final, so this is the biggest stepping stone of my career. “This time last year I was here playing in an amateur tournament, and now I’ll be on stage in the second-biggest event in darts. “It would be very special to win but there’s no pressure on me either because I never expected to qualify for this. Former UK Open finalist Newton was a quarter-finalist in last year’s World Matchplay, and enters their clash as the heavy favourite. However, the number five seed is taking nothing for granted, and admits: “I’ve known James since he was a cheeky kid and it’s great to see him in the World Matchplay. “He used to play in youth tournaments around PDC events so I’ve seen him grow up, and for him to have qualified shows how far he’s come in such a short space of time. 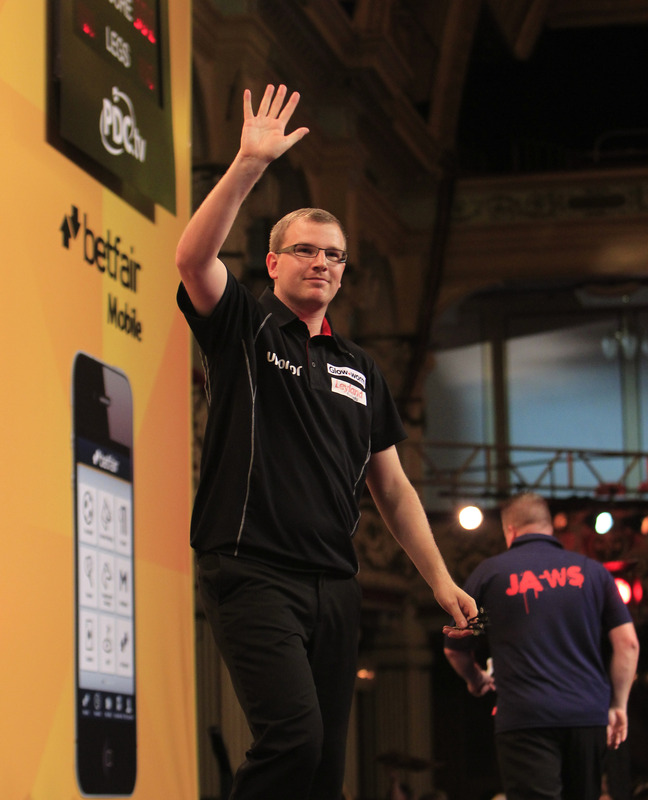 Mark Webster progressed into the second round of the Betfair World Matchplay with a hard fought victory over Colin Lloyd. The Welshman hit finishes of 116 and 110 to take crucial legs against the throw, as he completed a 10-6 win against the 2005 champion. “It wasn’t pretty but I got the job done,” said Webster, who faces Andy Hamilton in the last 16. “It was a battle but I held it together and I’m very pleased to get the win. Mervyn King almost toppled defending champion Phil Taylor but eventually lost out 10-8 to ‘The Power’, who is chasing a 13th Matchplay triumph. 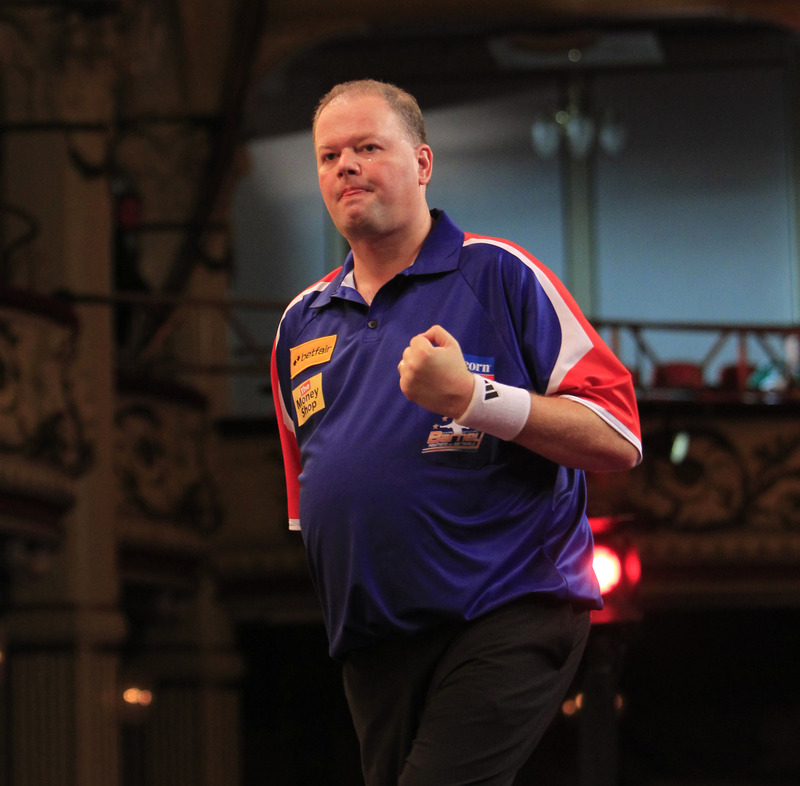 There was also disspointment for Dutchman Vincent van der Voort, who was defeated by an inspired performance from Ian White. 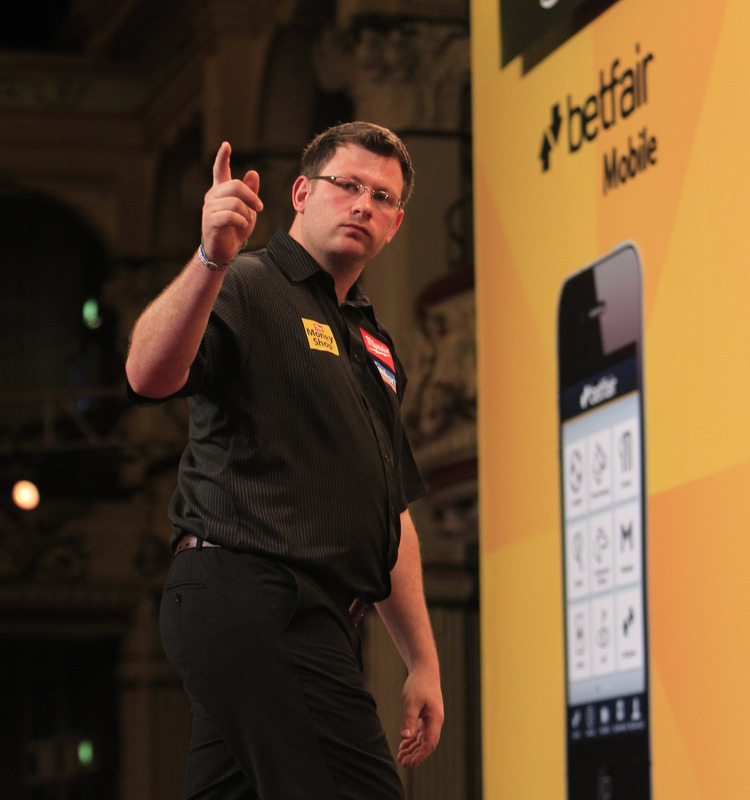 James Wade powered his way through to the second round of the Betfair World Matchplay with a comfortable victory over Richie Burnett in Blackpool. ‘The Machine’ brushed aside the challenge of the in form Welshman, triumphing 10-5 with a solid display. “I was happy with my performance but it wasn’t my best,” admitted Wade, who won the title in 2007. “Hopefully my best will come but tonight was all getting past Richie, who has been playing really well recently. ‘The Machine’, who has reached four finals in six visits to the Winter Gardens, will face Mark Walsh in the second round. 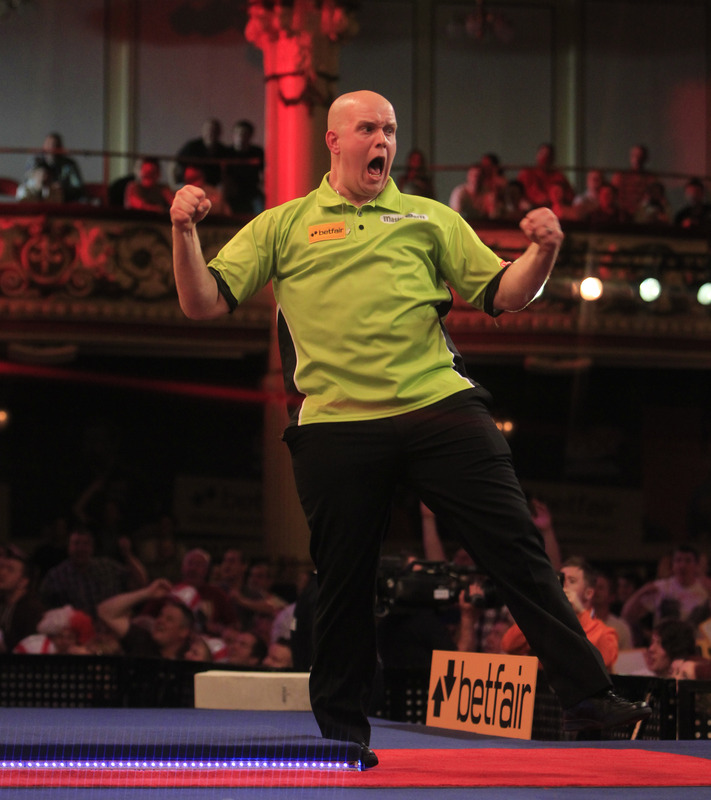 Michael van Gerwen also booked his place in round two. The 23-year-old Dutchman reeled off five consecutive legs to seal a 10-6 victory over Simon Whitlock. “I played well but Simon was not on top form,” said ‘Mighty Mike’, who will face Steve Beaton in round two. “Once I was on fire he couldn’t stop me. I managed to relax and I’m proud of how I played. 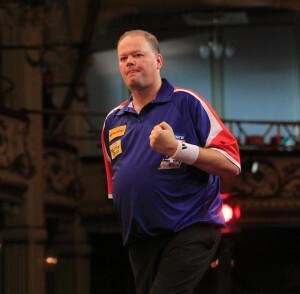 Monday night sees Mark Webster, Mervyn King and Vincent van der Voort all take to the Blackpool stage. Webster faces Colin Lloyd, King is up against Phil Taylor and van der Voort plays Ian White. Raymond van Barneveld began his quest for glory at Blackpool’s Winter Gardens with a convincing victory over Michael Smith. The popular Dutchman coasted to a 10-4 triumph over the St Helens youngster to set up a tasty second round clash with Terry Jenkins, after the world number ten launched a remarkable comeback to beat Belgian ace Kim Huybrechts. “Terry and I always have great battles so I am looking forward to playing him,” said van Barneveld, who is enjoying a rich vein of form. “I won the European tournament in Dusseldorf two weeks ago and I won an event in the Shetlands last week, so I am really pleased with how I am playing. 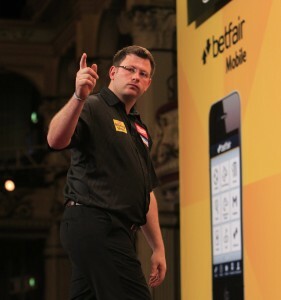 ‘Barney’ will lock horns with ‘The Bull’ on Wednesday evening, as he bids to claim a quarter-final spot. There was disappointment for Paul Nicholson however, ‘The Asset’ suffered an early exit at the hands of Andy Smith, while UK Open winner Robert Thornton was beaten by World Champion Adrian Lewis. 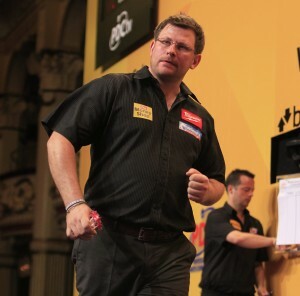 Tuesday evening sees 2007 winner James Wade return the venue where he has reached four finals. ‘The Machine’ takes on Richie Burnett before Simon Whitlock and Michael van Gerwen go head to head for a place in round two. 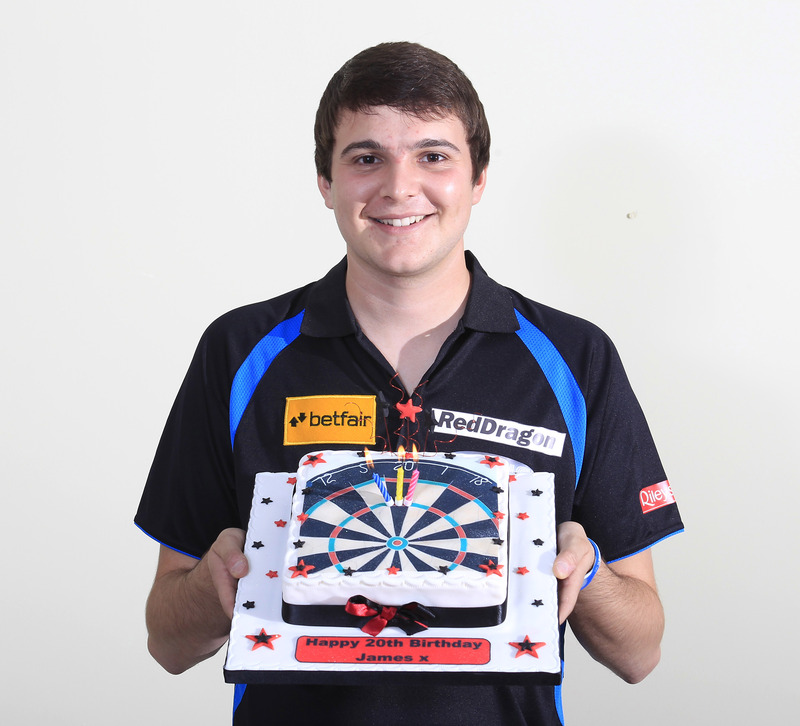 James Hubbard admits that qualifying for the Betfair World Matchplay exceeded even his own expectations in is debut season as professional darts player. But Hubbard, who takes on Fleetwood ace Wes Newton at Blackpool’s Winter Gardens on Tuesday, has an added incentive to make it an extra special occasion. The Norfolk youngster turns 20 on the day of his first round clash with ‘The Warrior’ and is aiming to make it a night to remember. 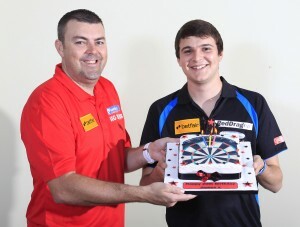 “I was delighted when I saw that the PDC had scheduled me in to play on my birthday,” said Hubbard, who is set to reveal his new nickname ahead of Tuesday’s match. “It will be one that I will always remember, but if i don’t win then it won’t be my greatest birthday ever. “I’ve just got to remember that I never expected to be in the Matchplay, take any unnecessary pressure off myself and enjoy it. “If I win then that will be a bonus but I also know that anything can happen in a tournament and that anyone who is in it has the chance to win it. So I will go in with that attitude. 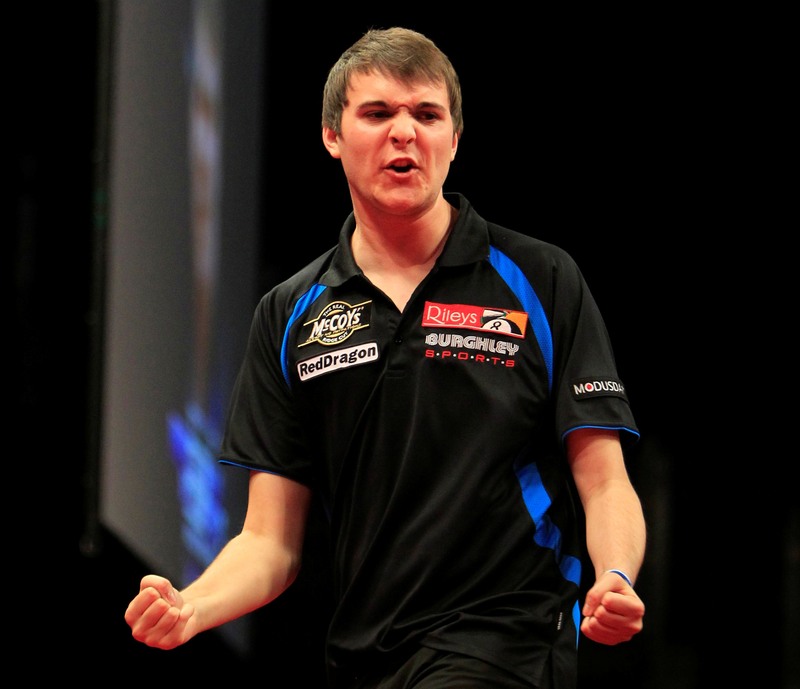 Hubbard qualified for the prestigious £400,000 tournament after a remarkable start to his professional career. After appearing at last year’s Grand Slam of Darts, Hubbard turned professional in January and has enjoyed a string of successes since. 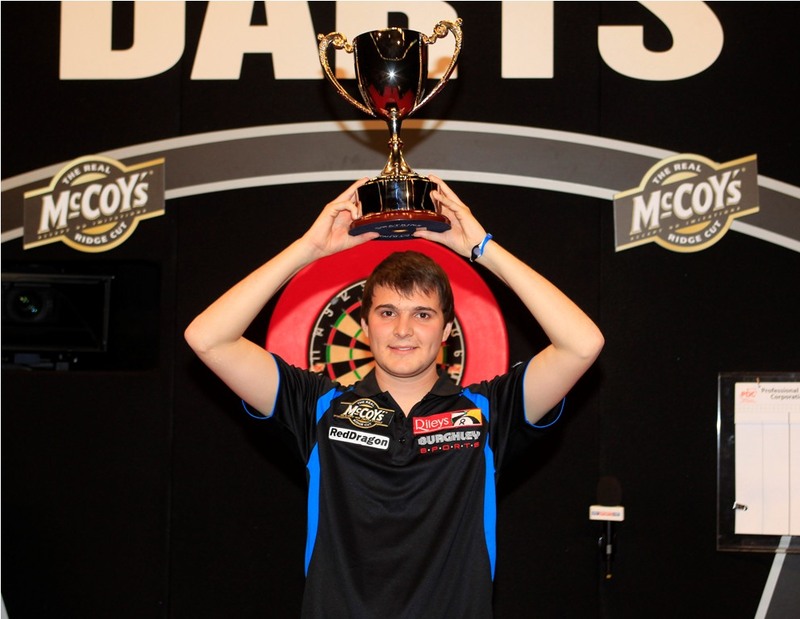 He beat Michael van Gerwen to be crowned as PDC World Youth Champion in front of 10,000 fans at London’s O2 Arena in May. And Hubbard says that his victory over the enigmatic Dutchman has helped to prepare him for playing on the big stage. He said: “Winning the youth final was massive for me. Not just in terms of winning the game itself but the way it has prepared me for things to come. The 19-year-old has coped well with his rapid rise to relative fame, after taking the title live on Sky Sports. “My life has changed massively since turning pro and even more so since winning the youth World Championship,” said Hubbard. “I’ve done a lot better since January than I ever thought I would. 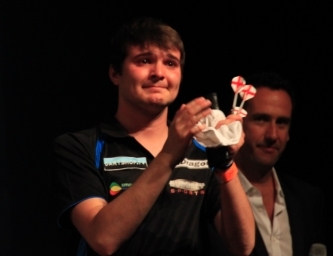 “My first target was to break into the top 80 in the order of merit and qualify for the UK Open. “I did both those things in the first six months and I should be in the top 64 after the Matchplay and should qualify for the World Championships and maybe even the Grand Prix, so I’ve already surpassed everything that I set out to achieve. “It’s not just in darts though. Things have changed enormously in other areas of my life. I’m a lot more comfortable financially, more confident and everything is going well. Hubbard has been particularly impressive in the European Tour events, where he has claimed notable victories over World Championship winner Adrian Lewis and runner-up Andy Hamilton, before sealing his place in the Matchplay with a good run in Dusseldorf. “I had said to a few people that I felt I needed to beat one of the very top players and that came against Lewis,” said Hubbard. “Winning that match just seemed to settle me down for whoever I was playing. “To beat the World Champion on stage in front of a few thousand people was pretty special and it is an achievement that I am very proud of. “I was the outsider to qualify for the Matchplay so I didn’t feel like I was under any pressure in Germany. “I had a good game against Hamilton but I rode my luck against Steve Brown, who missed about six darts to beat me. “I played really well against Mark Walsh though and it was nice when that winning double went in. Despite his rise to professional prominence, Hubbard still recognises the importance of the Youth Tour and has claimed victory on three occasions so far in 2012. “I find the Youth Tour events really help with my form,” said Hubbard, who is ranked second in the Youth Tour order of merit. “If you’re going through a bad patch it can help you find a bit of form and regain some confidence. “On the flip-side, if you are playing well then it is another tournament to keep some momentum going. Hubbard’s fantastic form has forced him to revise his ambitions for the rest of the year, but he is determined not to let the hype affect his future in the sport. “I want to try and be in the top 50 in the world next year. That is my target. He can also rely on the support of world number nine Mark Webster, who sponsors the youngster. The former World Champion believes that birthday-boy Hubbard will have many happy returns to the big stage whatever happens on Tuesday night. Webster said: “It is a massive achievement for him to qualify for the second biggest tournament of the year and he definitely has the ability to cause an upset or two. 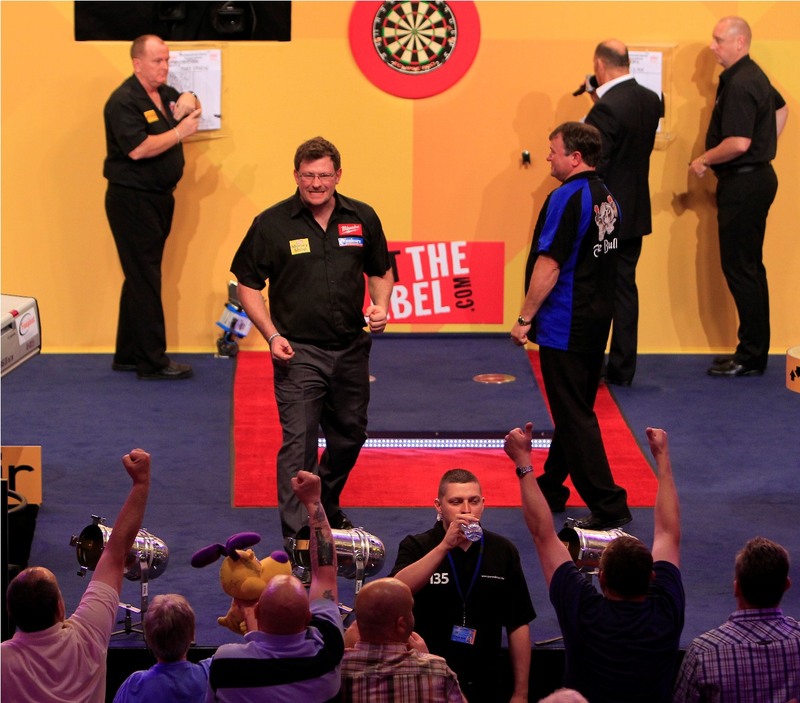 See some of the world’s top players at THE UNTOUCHABLES, Eastbourne, Friday October 19.